Fresh off the plane from Nigeria West Africa, a young girl is introduced to the bounty that is the American supermarket. Suddenly confronted with rows and aisles produce, meats, and jars… oh the jars of food with their pretty labels, I thought I’d stumbled into some sort of foodie and design paradise. Mind you, I had no shortage of food where I came from, but not it was definitely not packaged up and displayed like this. The first thing I started collecting was the Styrofoam packs of meats. After (of course) discarding the soggy tissue stuck on the bottom and thoroughly washed out the tray packs and proceeded to make things with them. I made little trays, picture frames etc. After a few weeks of this, I realized that it was futile to collect these little trays, as they just kept coming, and I was running out of uses for them. I eventually gave up my styrofoam trays, but not my love of creative reuse. That started out my love of reuse. I no longer collect Styrofoam trays, but I still find it hard to let go of beautiful glass jars and even tin cans. Glass jars will last forever if handled properly and will store everything from pantry items to hardware items. Luckily for me, there is no shortage of things to store around the house. Combine your glass jars and their tops with a little creative ingenuity and you can have an expensive looking glass jar that rivals anything you can find in a catalog or housewares store. 1. The lid is a plain black, so no need to spray paint. 2. It has a lovely tapered shape at the top that differs from other spaghetti sauce jars. 2. Very few markings. It only has measurement markings, which comes in handy for measuring liquids. 3. Very little writing on the lids. My least favorite jars for storage are Prego and Ragu (which is really ironic because I love their Garden Combination and Super Vegetable Primavera Sauces, so I end up buying more of those), or anything else with a lot of texture on the glass, and a Narrow Mouth. The narrower mouth jars work best for votive holders/lanterns. See below. 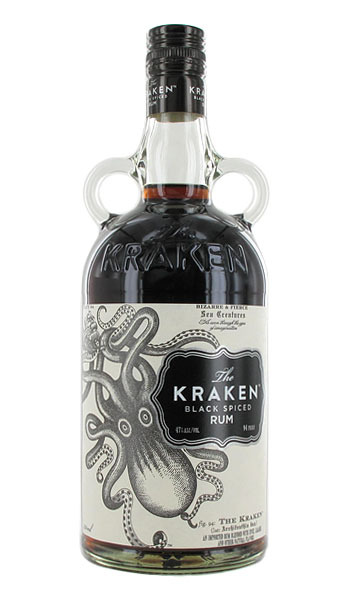 “RELEASE THE KRAKEN!’ and then store something else in its bottle. I mean, seriously, how gorgeous is that bottle (and it’s label)?! I use one to store dish soap, and another to store homemade pancake syrup. 1. Thoroughly wash any traces of food/sauce etc. 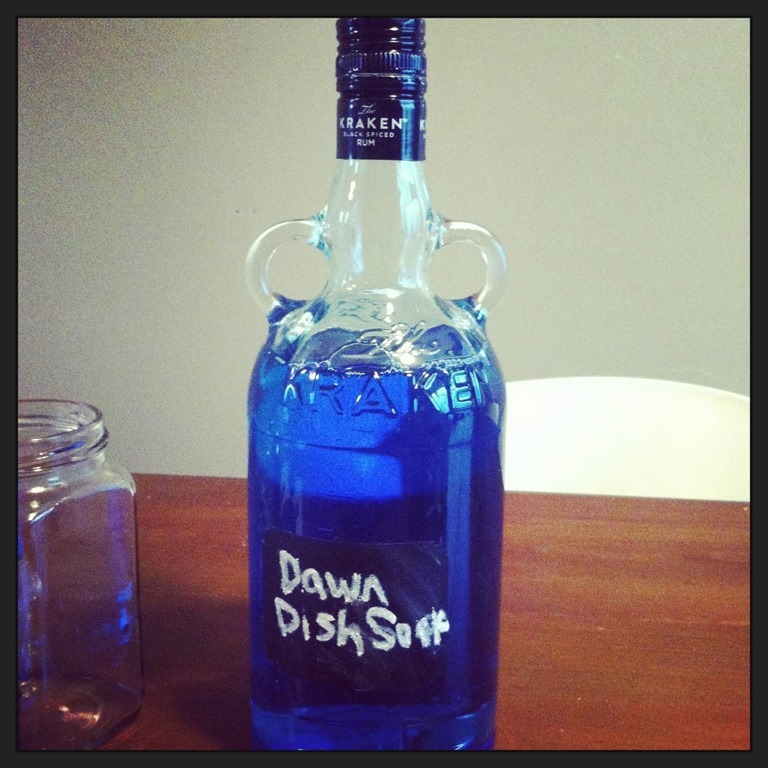 The only vessel I didn’t was my beloved Kraken bottle. I left some rum in the bottle to flavor my pancake syrup…(pleasedon’tjudgeme). 2. Make sure your vessels are thoughly dry, especially if storing dry goods, like beans or rice. You don’t want any nasties growing in there! 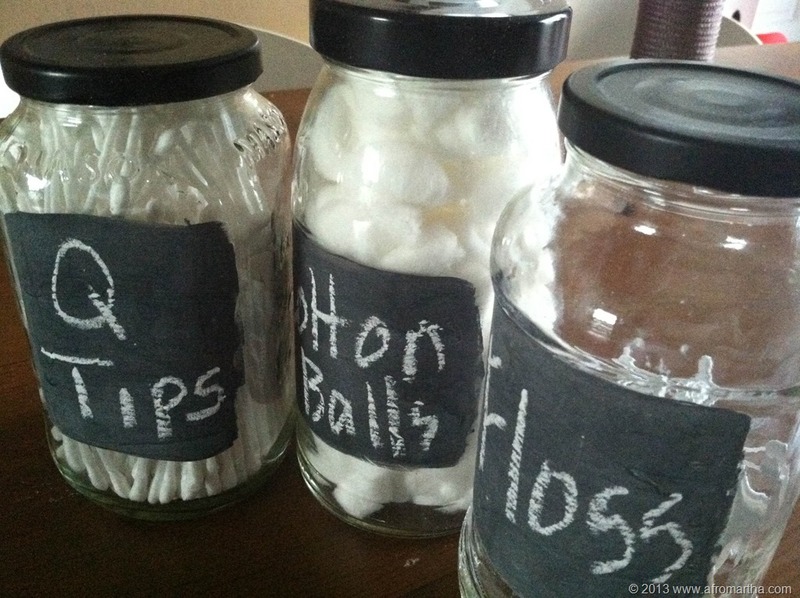 Or paint your jar with chalkboard paint. So, I made my own paint with 2 parts black house paint + 1 part plaster of paris. Similar to method to the video I did here. Make sure you moisten the plaster with water first. 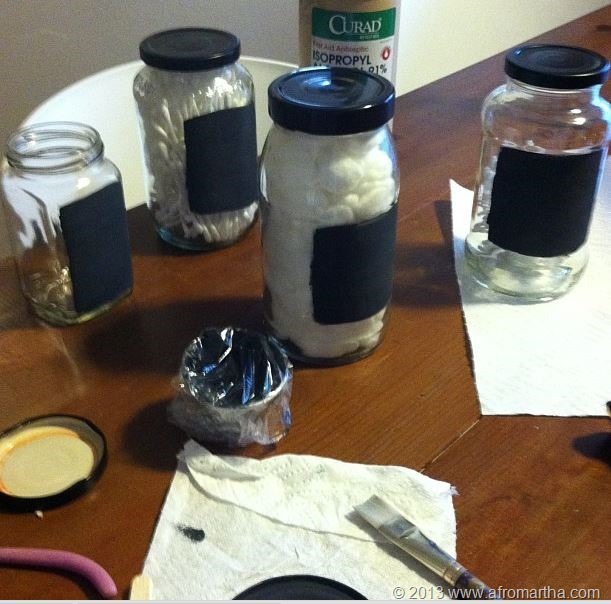 Roughen up the area you want to paint on the jar with sandpaper to ensure better paint adhesion. I painted on 3 thin coats, allowing each coat to dry in between coats. Since I’m too lazy to tape a square not a huge fan of perfectly straight edges, I just freehanded the whole thing. I do love it, however, there’s one teeny tiny problem I have, which is the chalk dust. I detest chalk dust. Your writing rubs off almost instanteously after writing…and it gets everywhere! Surely there must be a better way! And there is. I’ve discovered Chalk Markers work well. However I balk at the price. I use a white conte crayon instead. When you are ready to re-label, rub off the conte crayon with rubbing alcohol. This may take off some off your chalk paint, so use sparingly. 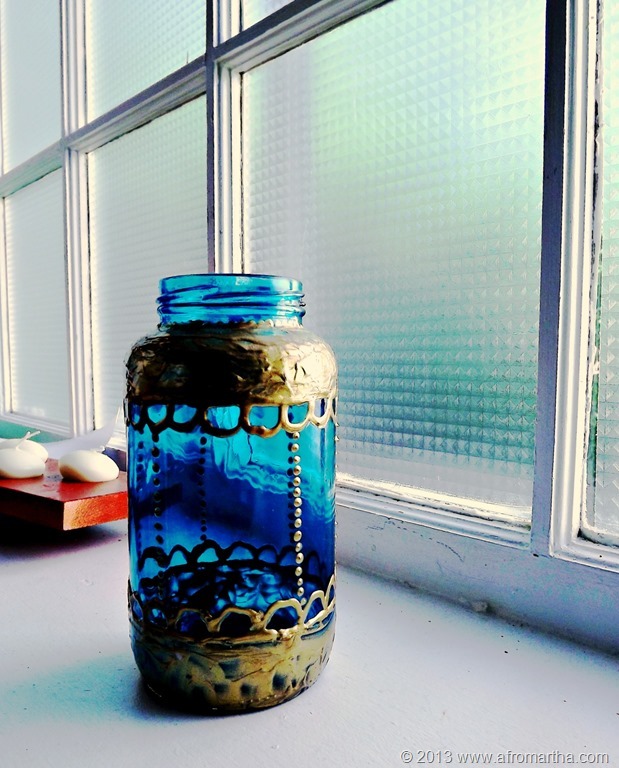 One other gorgeous idea I’ve seen and tried is to turn the jars into moroccan style lanterns. This is my rendition, which is not bad for a first attempt, but the others make mine look like child’s play. Want to see a truly gorgous collection? Visit LITdecor’s Etsy Shop. Well, I hope that my little collection has given you some ideas. I’d love to see how you reduce, reuse recycle! The afromartha Shop is Back! 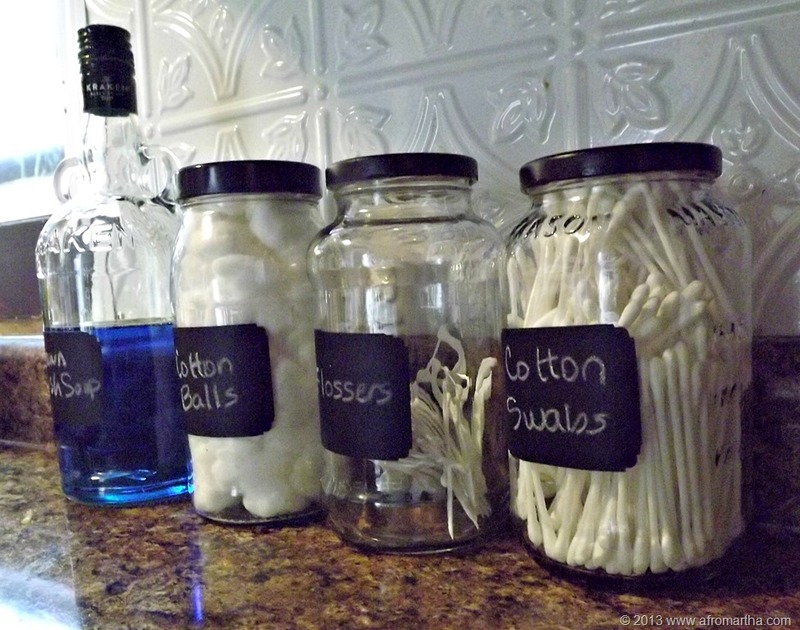 Oh, you really know how to repurpose those jars! Who knew at age 13 that you would be “called” into this line of work. I said I was going to store my dried goods in clear jars with chalkboard labels, but my two hands and rambling thoughts can only get but so much done. I’ll have to live some of those things vicariously through you! Thank you so much for your kind words! And yes, appreciation to your father for telling you about my site. Please come again.